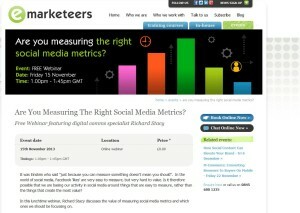 eMarketeers have asked me to run a free webinar on social media measurement next month. As you can see from the blurb, this is not a review of all the sundry measurement tools and techniques that are out there at the moment – in fact it will largely be a riposte to our belief in the effectiveness of these things. Rather I will be suggesting that we first need to work out what it is we should be measuring in order to then work out what tools we should be using to measure it. Please feel free to sign up, tell your friends etc. There are no limits on numbers. 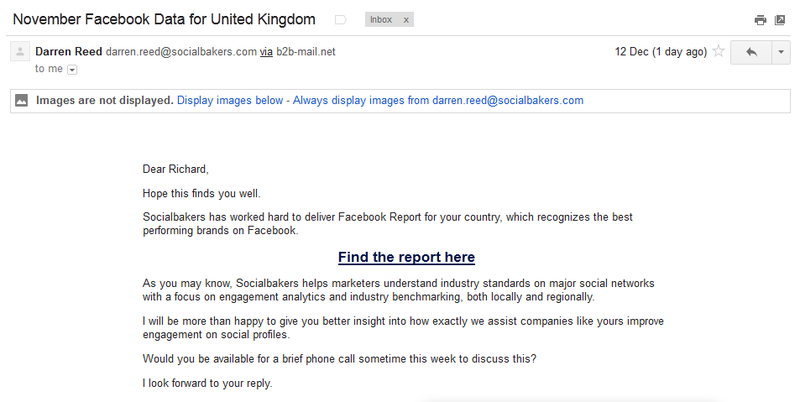 Yesterday I got an email from a chap called Darren Reed at Socialbakers (see above). I say I got an email from him, but in reality got an email from b2b-mail.net because I ended up on an list on account of having commented on piece on Socialbakers’ blog. I don’t think Darren actually sent it. Anyway this ‘slightly spam’ email drew my attention to Socialbakers’ latest Facebook Report for the UK recognising the ‘best performing brands on Facebook’ – whatever that means. One can see a theme emerging. Indeed it is a theme that anyone who studies Facebook will be be familiar with – namely that the main reason consumers ‘like’ brands is to get offers, freebies or enter competitions. I was pleased to receive this information because I was able to insert it into a presentation I was about to give to a bunch of marketing folk at Bilgi University in Istanbul in order to illustrate a point I was making in relation to understanding how to use Facebook. This point was that “just because something works doesn’t mean that it is working” – as in just because competitions are effective in Facebook does not mean that the most effective way of using Facebook is competitions. In fact there is almost nothing to be learned from the sort of data that Socialbakers et al may give us about effective postings or content in Facebook that will help us determine how to use Facebook effectively for the very simple reason that Facebook (indeed almost all forms of social media) are extraordinarily ineffective tools to use to put content in front of lots of people. Social media does not ‘do’ large numbers it ‘does’ small groups. Social media does not have scale built into it, in the way that traditional media does. The benefit you get from social media therefore does not lie in the numbers, the ability to ‘engage’ a lot of people, the benefit lies in in the ability to create relationships with very small groups of individuals, at any one moment in time. Critically, therefore, these contacts have to deliver something of significant value – i.e. hugely greater value than that associated with the sort of metrics that Socialbakers are measuring (likes, shares, comments etc) in order for the effort to be worthwhile. I was using this point to illustrate the main theme of my presentation – namely that we now have two worlds: the world of the audience and the world of the individual (I thought this was a rather neat theme to use given that we were standing is a city that has been defined by the fact that is sits at the physical and political junction between two worlds – the world of Europe and the world of Asia). Up until this point there has only ever been a world of the audience and as a result, most brands are simply trying to push approaches designed to be seen by audiences (i.e. lots of people) in front of individuals or groups. And, of course, this doesn’t work. As Hugh MacLeod memorably stated “If you talked to people the way advertising talked to people, they would punch you in the face”. This doesn’t mean that advertising doesn’t work, it means that advertising needs an audience in order to make it work, or as I, rather more charitably put it, “The great thing about advertising is that no-one take it personally”. The value of Facebook, and all of social media, lies in the ability for your consumers to tell you what they think of your brand and, potentially, to help you improve what it is your brand does. Pushing ‘engaging content’ out through Facebook is a total waste of time – consumers don’t want engaging content, they simply want a brand to be listening to them and answering their questions. Now if you can do this at scale in a platform neutral way (i.e. 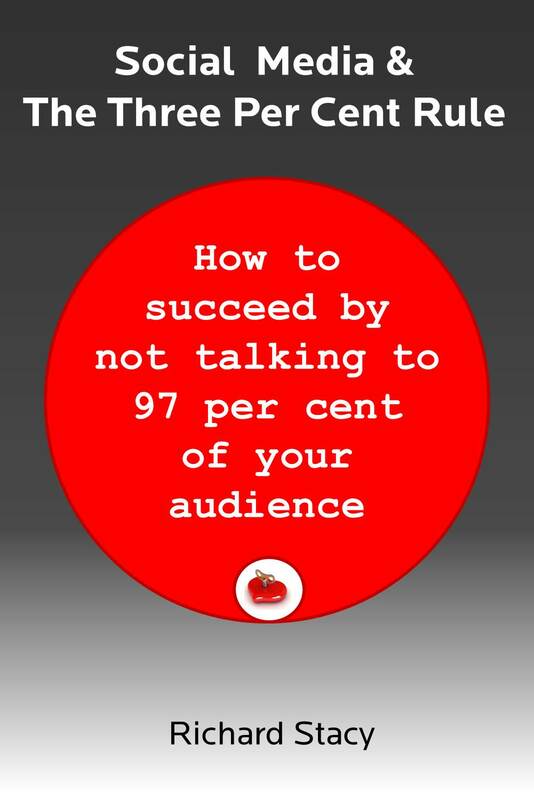 listening to consumers wherever they want to talk to you – blogs, Twitter, Facebook, forums etc.) you will be creating something of value – albeit Socialbakers won’t be able to measure it. In reality, as I have said before, you don’t need to attach metrics to Facebook, Facebook itself is metric – it measures what people think about your brand. Anyway – I will send this post to Darren. I am sure he won’t mind given the liberty he feels he has to send stuff to me. Let’s see how (or if) he responds. As an interesting footnote, a few weeks ago I was running a session with a group of post-graduate students at the European Communications School in the London College of Communication. Of the 30 or so members of the group only one used Facebook to have any sort of relationship with brands. A handful said they occasionally ‘like’ brands, but only to get access to offers and the rest said they only use Facebook to stay in contact with their friends. Is anyone surprised about this and if you are not, why do we then think Facebook is some sort of magic platform to ‘reach out to’ or ‘engage’ a significant number of consumers? We also then went on to do some basic brand mapping work in order to identify what sort of relationship people had with ‘the thing’ that is Facebook. What this showed is that people see Facebook as a utility. It ranks somewhere slightly above the relationship they have with a mobile phone network and a long way below the engagement they have with services like Google or products such as Apple. So, remind me again, why is it that Facebook is trading at an earnings multiple about four times greater than that of either Google or Apple? Maybe it is because marketing directors are being encouraged in the deluded belief that Facebook is some form of media platform that allows them to reach lots of people, rather than a tool that lots of people can use to reach brands often with content and requests that brands are unprepared to respond to (a tool for which, incidentally, consumers will not be prepared to pay – as my research with the students also confirmed). The changes to Facebook’s Edgerank algorithm (which is the algorithm Facebook uses to determine what information you see in your news feed) have been creating some controversy, not least because it has affected the ‘reach’ of many organisations’ Facebook pages and raised suggestions that this may be linked to Facebook’s desire to encourage page owners to pay for their reach, via prompted posts (see this post from AllFacebook). However, the underlying, and unquestioned assumption behind all this discussion is that ‘reach’ and ‘engagement’ are the metrics we should be using to measure corporate usage of Facebook. Why this assumption? These metrics come straight out of the world of traditional media where the role of media was as a channel to reach consumers. But social media doesn’t work this way. Social media does not have scale built into it in the way that traditional media does. Social media is not designed as a tool to reach lots of people, it is designed to allow small groups of people to connect with each other. Creating an approach that is designed to try and add scale to a social media presence, to chase numbers in terms of reach or engagement, is a waste of time. It is completely the wrong approach (and metric) to use. Facebook, and all other forms of social media, are tools that enable consumers to reach brands (if and when they want to). The only part of any Facebook page that has any relevance is the ‘Posts by others’ space and it is not the quantity of posting here that matters, but what the posts are about and how (or even if) the brand responds to them. Since these posts are often negative, or complaints, in reality the objective for most brands should be to minimise their Facebook ‘engagement’ – which of course you achieve, not by anything you do ‘in’ Facebook, but by how your brand behaves ‘in’ real life. Social media is not a channel and message identification challenge (as traditional marketing is) – it is a behaviour identification and response challenge and the metrics we use should reflect this. In fact, Facebook itself is the metric for brand behaviour, rather than something you should attached metrics to.